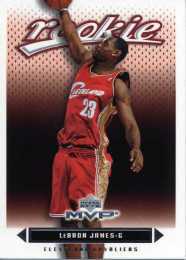 The 2003-04 Upper Deck MVP Basketball set is made up of 230 base cards that include 30 rookie cards. Since a hobby box consists of 24 packs of 8 cards each with every pack including one rookie card, set builders should find this to be a relatively easy set to complete. Every box also includes one memorabilia card, so you'll have the added enjoyment of finding items like a warm-ups or shooting-shirt card. Also watch for ProSign cards that features autographs of some of the best athletes in the NBA�. The base cards in this set (common players and rookies) feature a clean, standard front design that integrates the player's name, position and team in the bottom center area along with the Upper Deck MVP logo. The card backs also follow a standard design of player vitals, career statistics and general notes. Keep in mind that both the card fronts and backs contain a white border around the top, bottom, left and right edges, so centering will be a consideration when grading these cards. Common players make up card numbers 1-200 in the set and rookie cards are numbered from 201-230. 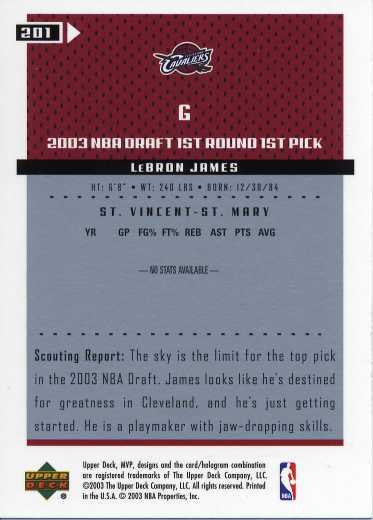 With rookies of LeBron James (RC card #201 shown below), Carmelo Anthony, Darko Milicic, Dwayne Wade, T.J. Ford, Chris Bosh and Kirk Hinrich, this set provides a nice option for getting rookie cards of the new 2003-04 players. The memorabilia cards combine for an overall odds of 1:24 (1 card in every box) while the subset parallels combine for an overall odds of 1:175. Expect to pay about $2 per pack or about $40 for a hobby box. At this price, 2003-04 Upper Deck MVP Basketball provides one of the lowest-priced options for collecting 2003-04 basketball cards, including the key new rookies. All things considered, 2003-04 Upper Deck MVP basketball is a nice set to collect, especially for those collectors looking for a traditional-looking product at a reasonable price. Set builders should enjoy putting together a complete set of this product and will also receive several of the nice subset and insert cards during the process.